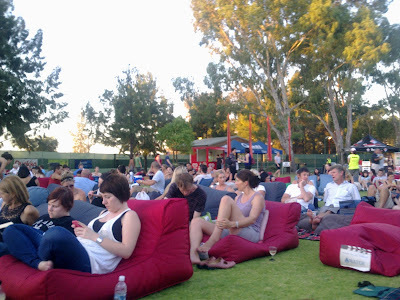 Perth Hacks - best tips, hints and bargains: Things to do in Perth: Outdoor Cinemas! Many people who come to Perth say that it is boring but often they are just too used to one type of enjoyment such as shopping only or eating. One of those things to do on a hot Perth night is get to an outdoor cinema. The Perth International Arts Festival runs through the summer months in Perth. There are two outdoor cinemas that screen award winning films from around the world. Get there early as the gates open 6pm and have a picnic dinner in the lush surroundings just before the movie. As the time nears to 8pm when the movies start, grab an ice cream and a coffee from the stalls and make your way to the beach chairs for the movie. It will be one unforgettable night in Perth. One cinema is in the Somerville Auditorium at the University of Western Australia. Follow the people carrying picnic rugs to find your way there. The other one is in Joondalup. To find out what is screening tonight, details can be found here. Also, for more contemporary and popular movies, you can make your way to Burswood Entertainment Complex where Movies By Burswood screens outdoor movies during the summer months as well. My personal favourite is Somerville's outdoor cinemas as it seems to be one of Perth's best kept secrets. You can check it out as long as you help to keep it that way. I prefer drive in cinema - Galaxy in Kingsley. Really cheap and awesome on double movie nights.